The Cactus Alpha Textures are now for sale on all our marketplaces: SL Marketplace Shop and the InWorldz Marketplace (InBiz) and Kitely or from our inworld main stores in Second Life and InWorldz. For more plant textures please visit the blog HERE. Below you can read more about this texture set and see the advertisement poster. 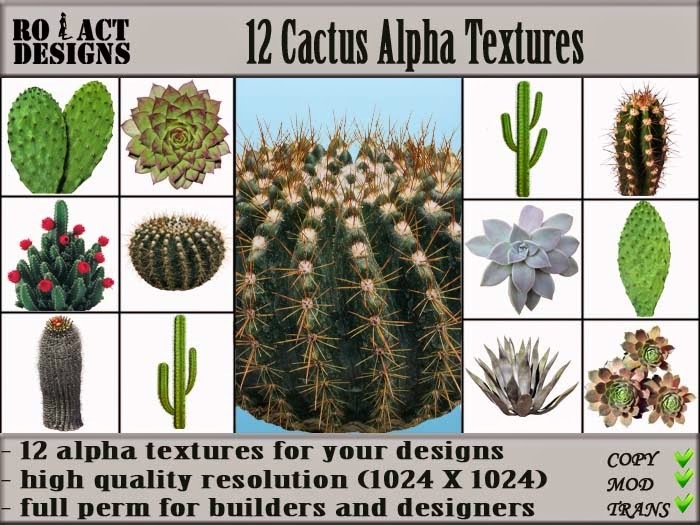 This set contains 12 alpha textures in great quality resolution (1024 X 1024) of cactus plants in pots. Full permissions for use in your designs, builds etc. You are not allowed to distribute for free or resell these textures, original or modified, as textures themselves, separately or as part of a pack. You can use these textures freely, within the game platform you bought them from, for building your own objects that can be freebies or products for sale as long as they can't be extracted from your item. These textures are not refundable as they are COPY/MOD/TRANS. The Climbing Vines Alpha Textures are now for sale on all our marketplaces: SL Marketplace Shop and the InWorldz Marketplace (InBiz) and Kitely or from our inworld main stores in Second Life and InWorldz. 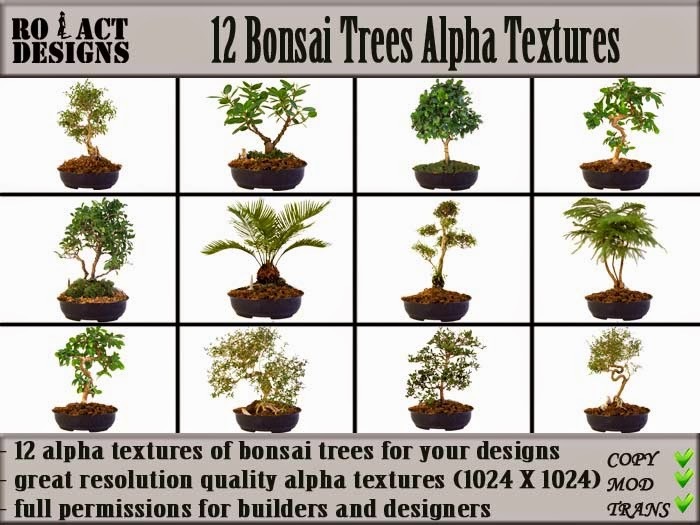 This set contains 12 alpha textures in great quality resolution (1024 X 1024) of bonsai trees in pots. The Halloween Dead Tree Silhouettes Set 3 are now for sale on all our marketplaces: SL Marketplace Shop and the InWorldz Marketplace (InBiz) and Kitely or from our inworld main stores in Second Life and InWorldz. For more Halloween Textures visit the blog HERE. Below you can read more about this texture set and see the advertisement poster. If you have any issues with this set of textures please send a NOTECARD to Ariana Monaron and I will do my best to solve it. 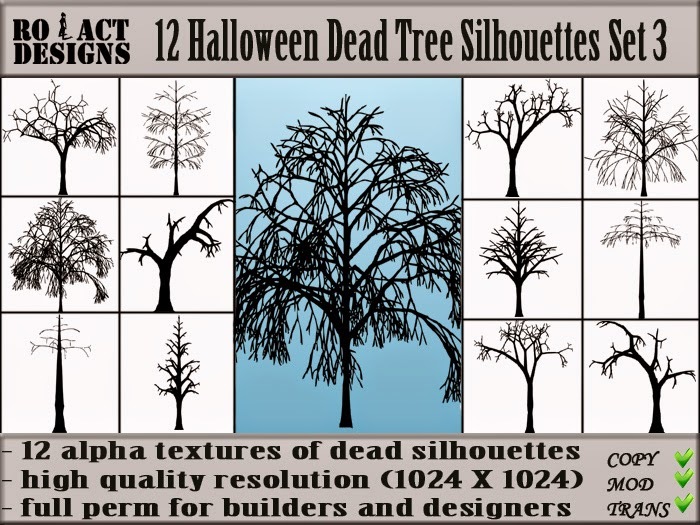 This set contains 12 alpha textures in great quality resolution (1024 X 1024) of dead trees perfect for Halloween decoration or any of your other builds and designs. What would you like to see more in our store?